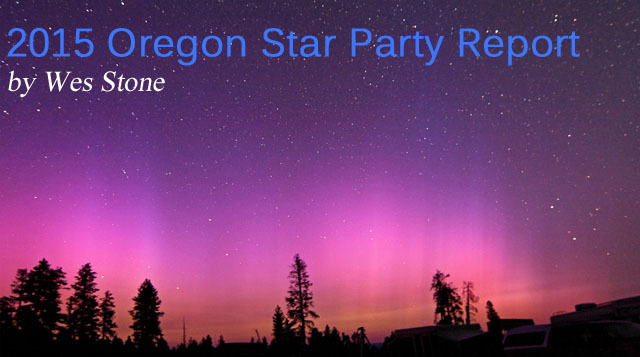 The drought continues, and so does the fire/smoke jinx for the Oregon Star Party. 2015 wasn't one of those years to seek out far-southern objects, or anything near the horizon. Skies overhead were just OK most of the time. But, given that the smoke was even worse at home, I'm glad I went for my 22nd consecutive year. The upsides? Wide-open skies to catch the abundant Perseids during their Thursday morning peak. Numerous fireballs that punctuated observing sessions. Bonus auroral displays late in the star party. Here's a brief account of my observing adventures. For some more visuals, visit my OSP Photo Album. I pulled in to the star party a bit after 5pm. I had passed through a rain shower back on Road 42, and a few drops splattered me as I waited for it to get dark. The clouds to the south looked ominous, but the night remained dry and rather warm. Skies were mostly cloudy at dusk, with a few breaks. I went over to Dan Gray's setup for a bit, and tried to find comet C/2012 F3 (PanSTARRS). The alleged 13th-magnitude comet didn't yield to the 28" under these poor conditions, and indeed I didn't find it in my 10" on the two occasions I tried for it. 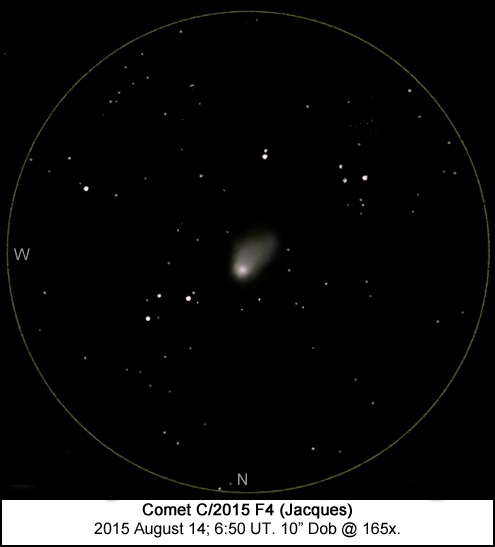 Back at my own scope, I did find comet C/2015 F4 (Jacques), which I had seen in July. This small, condensed comet was buried in a rich star field between Lyra and Cygnus. Because of the generally poor conditions, I decided to wait until later in the week to sketch it. After looking at a few deep-sky targets, I started a meteor watch, but almost immediately discontinued it because of the passing clouds and my fatigue after the long drive. I took a nap, and started counting again at 3:03am. In the next 72 minutes, I counted 43 Perseids, 15 sporadics and 5 South Delta Aquarids. Initially, there were some minor obstructions by passing clouds, but these cleared midway into the watch. Transparency was well below average for OSP, with limiting magnitude 6.5-6.6. Even given the rather poor conditions, Perseid rates seemed a bit low for the morning before the peak. Perseids were relatively faint, with no negative magnitude meteors during the count. As twilight brightened, lightning flashes were evident from a line of thunderstorms well to the east. Orion rose over the thunderclouds and lightning, making for a nice view and some good photo opportunities. Wednesday was "main event" night. I was going to dedicate the whole night to the Perseid maximum with counting and some photography. So, while I set up my scope and looked at Saturn (pretty nice considering its low altitude), I was mainly anticipating the meteor shower. Early in the evening, conditions were as good as they would get throughout the star party, although the smoke and haze meant that the lower 30 degrees or so of sky lacked contrast. Even overhead, the sky was a couple of tenths of a magnitude short of a truly excellent OSP night. That still meant limiting magnitudes right around 7.0 and a lot of detail in the Cepheus/Cassiopeia region of the Milky Way. My first Perseid count hour started at 10:18pm. The low radiant elevation in the evening means fewer meteors, but there was a chance that the Perseid maximum might occur early and provide a boost to evening rates. In one hour, I counted 43 Perseids and 15 other meteors. Again, these rates were lower than I had expected. A quick-and-dirty Zenithal Hourly Rate calculation came to 76. Perseid brightness seemed normal, with several meteors of magnitude -1 and -2. My next count hour was the "post-midnight hour". I counted from 12:04-1:04am. Rates increased to 68 Perseids and 17 other meteors. Bright Perseids were even more common, with one reaching -3. Apparent spurts of Perseids were evident, as at 12:51am when I saw 5 Perseids in one minute. ZHR for this hour was about 96. I took another break and then counted for two hours into morning twilight. From 2:09-3:09am, I counted 100 Perseids and 17 other meteors. OSP 2015 thus joined 1994, 2004, and 2010 as years when I've counted at least 100 Perseids in an hour during the star party. Again, there was a -3 Perseid fireball that left a persistent train. I also saw two very faint Perseids during this hour that I estimated at magnitude +6. There were numerous minutes when I recorded 3 or more Perseids. ZHR was about 114. My final count hour was the highlight. From 3:19-4:19am, I counted 110 Perseids and 28 other meteors. There were a couple of "ground-lighting" Perseid fireballs. One of -5 left a persistent train for about 15 seconds near Vega, and later a -6 Perseid with several bursts left a train for 20 seconds. This really looked like a Perseid peak. ZHR for this period was 111, with the increasing radiant altitude being mainly responsible for the higher rates. At 4:19 as twilight started to become apparent, I got up for a necessary break. My counting was over, but the Perseids continued to drip into the brightening sky. Overall, my Perseid rates and ZHRs were very similar to those on August 12/13 in 2010. To repeat my notes from that year, while these Perseids may not have been as spectacular as the peaks in 1994 (peak hour of 179 Perseids with many fireballs) and 2004 (peak hour of 127 Perseids), "anytime I see 100 meteors per hour I consider that an impressive shower!" 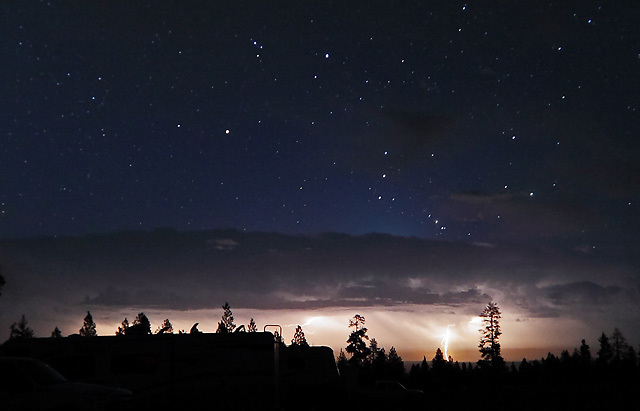 Prior to the star party, Thursday had been flagged in the weather forecasts as the day most likely to feature thunderstorms. There were no real buildups during the day, but the weather was very hot. I dropped by the workshop Ben Canales was presenting on night photography, but the information presented was really what I already knew. My 2008-vintage Rebel XS is showing its age versus the newer high-ISO sensors. It does what it does, and that's generally OK with me. Early in the evening, the word was out that it was supposed to cloud up around midnight. The patchy clouds streaming from the south seemed to be cumulus that should die out as the night wore on, but they did the opposite and took over the sky. I did manage a sketch of Comet C/2015 F4 (Jacques). The comet (about magnitude 10.5), was well-condensed, with a nonstellar condensation on the NW edge of the coma. The coma was elongated toward the SE, becoming a short fan-shaped tail. There were subtle hints of structure in the tail. With the clouds messing up the view, I decided to turn in. I woke up every once in a while, but the sky conditions didn't improve. Perseids continued to fall, but I wasn't up to doing a count and figuring out obstructions. The final indignity of the morning was that I woke up to smell smoke, which had settled in before sunrise. It seemed an ominous note. Sunset on Friday presented the sun as a red ball through thick smoke, with some dark clouds to the west as well. Skies cleared off, although the pall of smoke remained around the edges. It was a night for exploring near the zenith. As it turned out, I mostly explored galaxies in Draco. Seeing (as in steadiness) was much better than average. 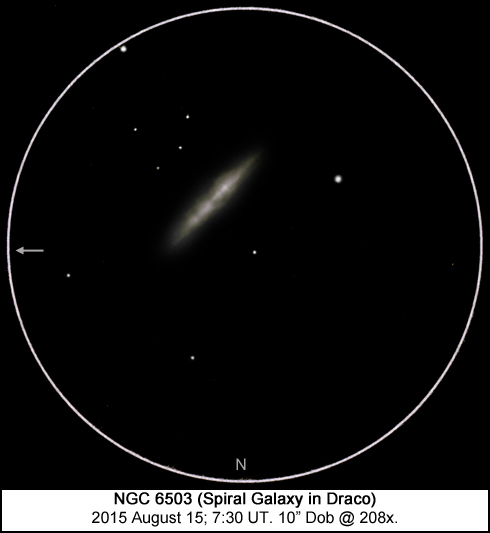 NGC 5905/5908: Galaxy pair in Draco. Both are visible at 47x and appear to be separated by a squashed circlet asterism. At 165x, 5905 is faint, oval, slightly elongated WSW-ENE. Brighter in the center. Nucleus, which appears stellar and faint, is slightly displaced to the E, and mottling is fleetingly visible with some condensations on the W side of the inner halo. With averted vision, the halo diameter appears to grow with a ghostly, diffuse outer halo surrounded by a number of threshold stars. 5908 much elongated, slightly more condensed than 5905, but covers about the same area. Elongated ~3:1 NW-SE. Brighter in center, nucleus looks nonstellar. Hint of a central disc or bar along the major axis, extending more toward the N end. Some mottling visible along the axis, strongest just SE of the nucleus. 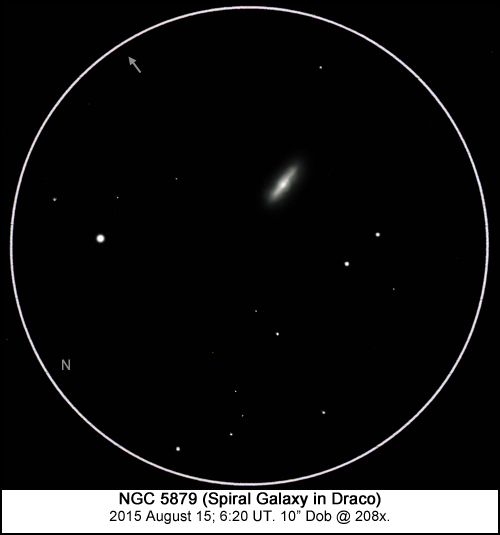 NGC 5879: Spiral galaxy in Draco. 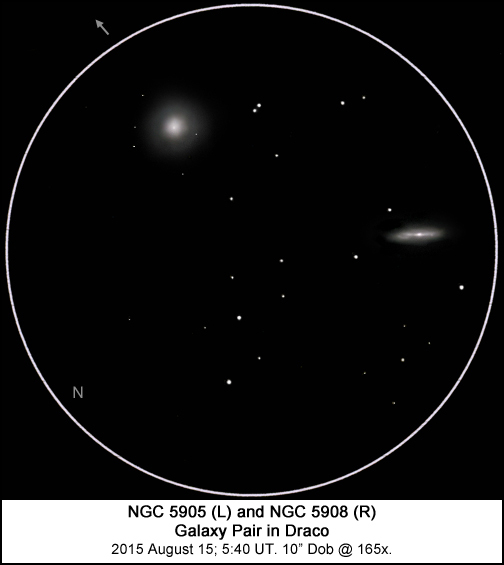 At 47x, a triangle of NGC 5879, NGC 5907 and NGC 5866 is circumscribed by the field stop. NGC 5879 is fairly dim and small compared to its bright company, but has a high surface brightness and an iridescent greenish glow. At 208x, much elongated 4:1 N-S. Much brighter in the center, with a slight bulge and a bright disc/bar along the center of the major axis. Nucleus is nonstellar; some mottling is evident S of the nucleus. 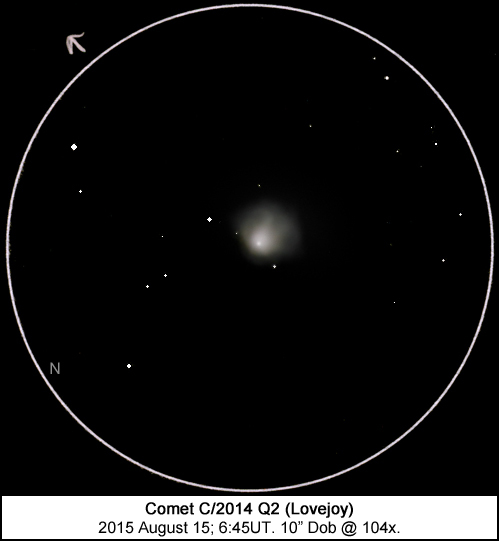 Comet C/2014 Q2 (Lovejoy): Last winter's star comet was still hanging on, at about 10th magnitude in northern Bootes. Transparency was extremely variable during this observation. Sometimes the comet almost faded from view; other times the comet appeared larger and many faint field stars became visible. Comet easily found and seen at low power; resembled an unresolved globular cluster. Fairly condensed. At 104x, the comet had a fairly prominent central condensation but no stellar nucleus. Inner coma not well-differentiated from the outer coma; at times appeared to have more of an E-W elongation while the overall elongation of the comet was more NNE-SSW. Not much structure; maybe a couple of faint tailward (southward) streamers. Otherwise, coma smooth and misty, gradually fading out. 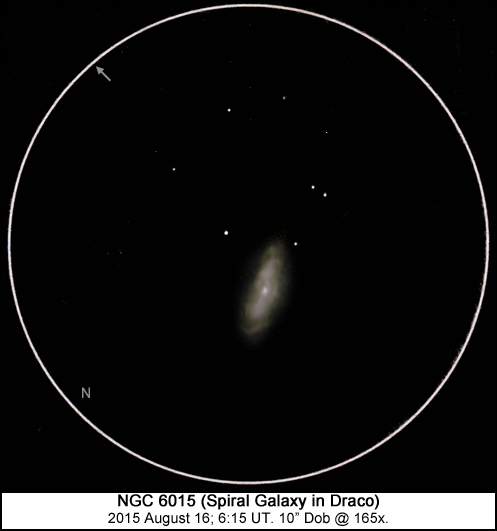 NGC 6503: Spiral galaxy in Draco. Very bright and large. Much elongated NW-SE. Brighter along major axis, but no distinct central brightening. Rather strongly mottled, with patchy and diffuse mottling on SW edge of the disc. After this run of galaxies with the comet thrown in, I took a break and a nap. I got up to photograph a bright Iridium flare in the middle of the Summer Triangle. I turned my attention to another comet, 88P/Howell in Cepheus. A Perseid fireball streaked toward the northern horizon and left a glowing train. 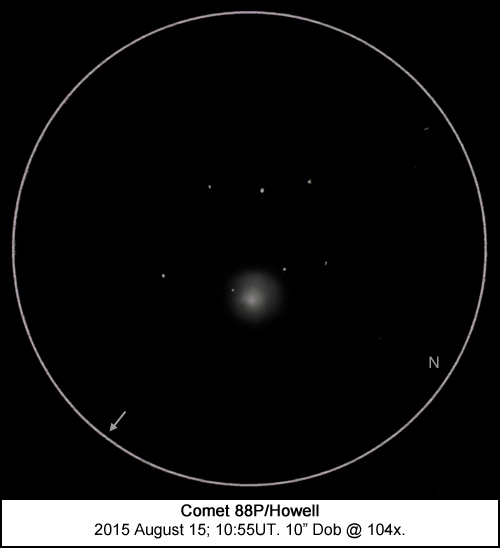 Comet 88P/Howell: Faint, round, slightly condensed. It's been my tradition for a number of years to hunt down any comets that might be visible during OSP. This year, aside from the 3 I had already sketched and the elusive C/2012 F3, the rest of the comets were not only faint but buried in smoke near the horizon. Comet 67P/Churyumov-Gerasimenko, famous for the Philae lander mission, was one of these. As I debated whether to try to pull the comet out of the murk in Gemini, I noticed the aurora. 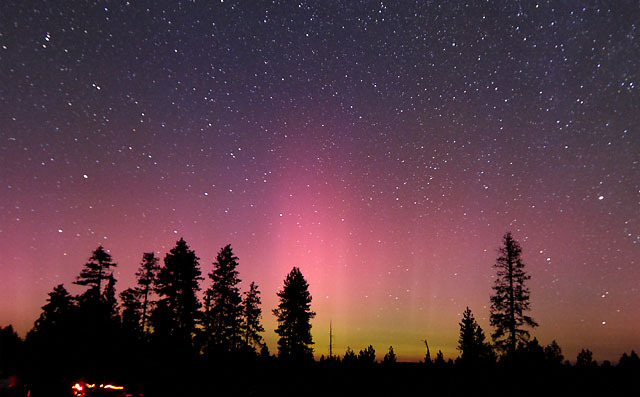 It started out as a pronounced glow along the northern and northeast horizons, and then developed into multiple pillars of light that reached higher than Polaris. Normally, I detect a green glow during aurora that are even fainter than this one, but this display seemed colorless. When I started taking photos, the aurora blossomed on the screen into purples and blues. I started taking photos at 4:09am. The aurora was initially dim, but grew in coverage and intensity. The pillars marched eastward along the horizon and sometimes split. Some faint, flashing upward motion was visible. The display peaked at 4:25am before receding and then disappearing as twilight became too bright. On Saturday, I spent some time walking around the site and especially enjoyed looking at the sun through Chuck Dethloff's excellent H-alpha setup. I joined the group photo and sat around at the door prize drawing without my number being called. Saturday evening's smoky sunset was a repeat of Friday's. I was a bit too burned out to do much serious observing on my final night. I tracked a long International Space Station pass through my Dob, and grabbed a burger and a mocha at the food trucks. I looked northward at the green glow of incipient aurora, and fired off a few exposures when it briefly burst to life. This display, which peaked at 12:55am, was fainter and more compact than that of the previous morning, and featured more green and red/pink hues. Among all this, I visited a couple of additional galaxies in Draco. NGC 6015: Spiral galaxy in Draco. Rather large with fairly low surface brightness. Elongated at least 2:1 NE-SW. Has a core but no stellar nucleus. Core may be a bit oval and is not much brighter than the surrounding inner halo. Mottling is visible along the major axis in the inner halo both SW and NE of the core, and also hints of some irregularities in the outline of the inner halo. Faint, curving structure visible in the outer halo. I also visited galaxy NGC 6140, but felt conditions weren't quite good enough to show the galaxy at its finest. I capped off the star party with a final 90 minutes of counting meteors. Three mornings after the peak, Perseid rates were pretty low, but still averaged 14 per hour. My totals for the session (1:00-2:30am) were 21 Perseids and 17 other meteors. Limiting magnitude was 6.7-6.8, about the same as on a good night in my yard. With a long drive ahead of me, I retired to my sleeping bag once again. Return to Wes's Astro Home Page.